While this news is primarily of interest to developers, it’s good for the broader community to be aware of progress being made “behind the scenes.” It’s important for all BTG users and BTG investors to know that we’re constantly improving our infrastructure and environment so that development progress is well-supported, for outside developers as well as for those working on the Bitcoin Gold Project, itself. 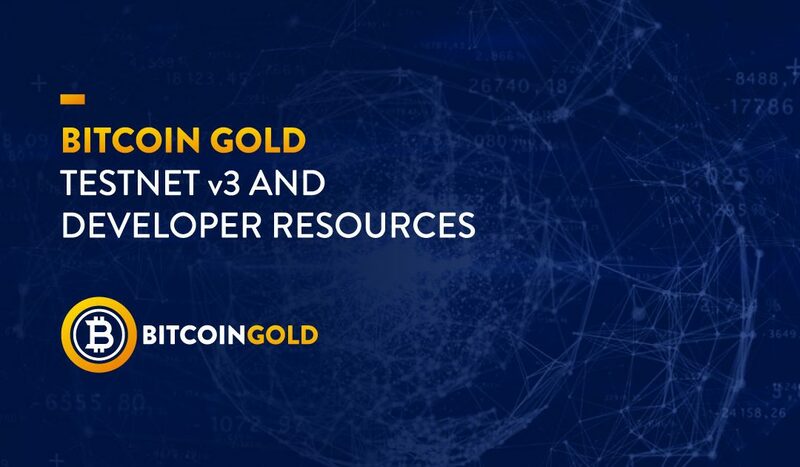 The team has recently finished a testnet reset for the Bitcoin Gold ecosystem and has stood up a few new resources that are useful to developers. A testnet is critical for developers to be able to freely experiment and trial their ideas without having to put real BTG on the mainnet at risk. We’ve established this testnet infrastructure to give developers a system to work with that will be readily available. We want all devs, from professionals to hobbyists, to be free to work without worrying about a test environment. Another notable development: this testnet uses a new state-of-the-art Difficulty Adjustment Algorithm (developed with DAA researcher zawy12). This refined algorithm should be more sensitive to rapid changes in network hashpower while being less likely to over-compensate and should reduce the impacts of large hashpower swings on the overall block find-time. We plan to incorporate this improved DAA on the Bitcoin Gold mainnet in the future. The changed DAA on the testnet has no impact on developers writing software that uses BTG. Large organizations or projects may want to stand up their own private Insight instances on testnet and mainnet, but ours will be kept public to ensure that everyone around the world has a fair chance to get involved with developing software for blockchain. An SPV Wallet (Simplified Payment Verification), sometimes called a “Light Wallet,” greatly reduces the resource load necessary to provide wallet services. This is important for developers working on limited resources, or for those who are developing tools intended to work on low-resource systems. On the mainnet, there’s security added to the whole network each time another full node shares the full blockchain, but for development, testing, and some services, it’s good not to have to download and parse the entire blockchain. I’m a developer. How do I get on the new testnet? Technical details are published on the Tesnet v3 wiki on GitHub3. All the testnet components described above are open to the public, and are built with open-source projects. While it should be clear that this helps make our ecosystem accessible to new developers, it’s worth noting that having this infrastructure in place also eases the project’s own development burdens! Simply put, it makes it easier to work, and makes the BTG development space more inviting to new developers. Establishing and maintaining these testing resources is vital to the continued healthy growth and development of the code for the Bitcoin Gold, for the many projects being built for it and on it – and the many projects new developers have yet to conceive!